These compact Minichillers are an economic and environmentally friendly cooling solution for many laboratory applications. A calculation of water and waste water costs shows a Minichiller can save up to 48,000l of water in a working week and, due to its low procurement price, return on investment is achieved within a very short time. Units have small footprints and are suitable for cooling reactor blocks, vacuum pumps, rotary evaporators, or heat exchangers. Minichillers allow stable application conditions due to constant values for temperature, pressure, and through flow quantities. They are also perfect for continuous operation at ambient temperatures up to 40°C. Despite the economic purchase price, coolers are well equipped and have a large temperature indicator, fill level indicator, and status LEDs for the pump, cooling and heating. A heater is also available, with the temperature range able to be extended to 100°C. 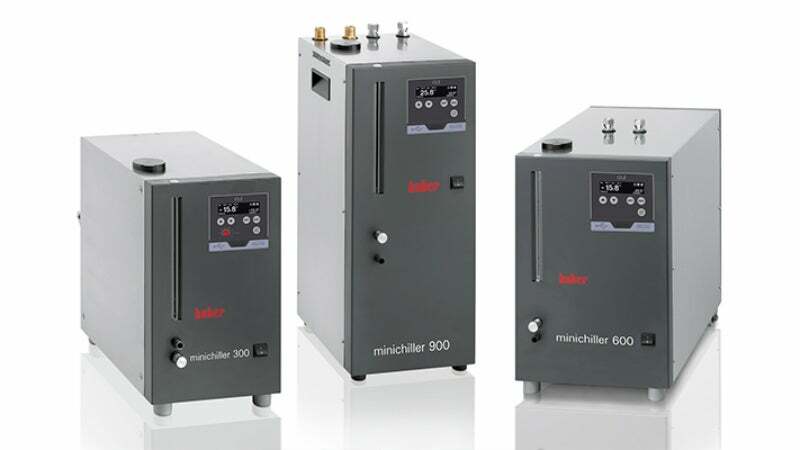 Minichillers are available as both air and water cooled models using natural refrigerants.